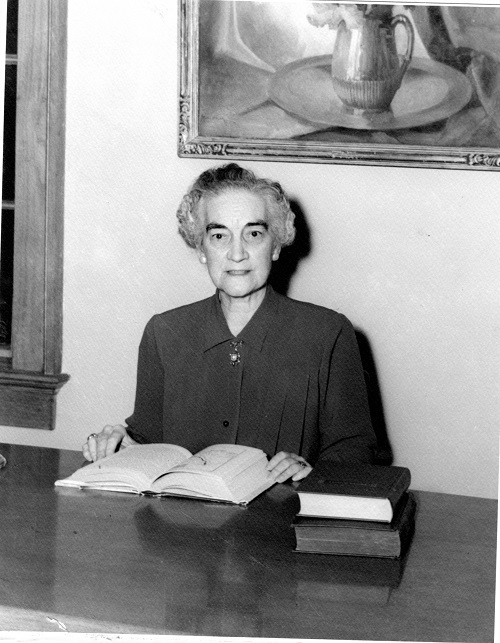 For forty-eight years, Mary Sydnor DuPre presided over Wofford College’s library. She wasn’t the first person who had the title of college librarian. The college had a small library from its earliest days, and the literary societies also had libraries. A few other names appear in college catalogues as the librarian, but Miss DuPre held the position longer than any other individual in the college’s 160-plus years. In fact, she held the position for nearly half of the college’s first century. She had grown up on the campus. Her grandfather was founding faculty member Warren DuPre, and her father was longtime science professor Daniel Allston DuPre. Her sister Helen DuPre Moseley was Spartanburg’s postmaster. She had grown up with many of the faculty members who she later worked with, and was related to several others through various DuPre family marriages. In her own words, Miss DuPre explained her first days as librarian. “In the fall of 1905, the dear old Wofford bell rang out its beautiful tones, calling the students and professors to class, and me to assume my duties as the librarian. At 8:30 that September morning, I entered the library rooms in the main college building [about where today’s rooms 222 and 224 stand]. I had played as a child around an in this building, so I was naturally interested and excited to have a position in the wonderful place that I loved. On this particular morning, Dr. D. D. Wallace, chairman of the library committee [and chairman of the history department from 1899-1947], greeted me, and after giving me some advice, turned over to me the Library keys. On my desk was a small bell, which Dr. Wallace told me to tap if the students talked too loud. After a few days of tapping, I decided to remove the bell, and instituted the unwritten law of whispering and tiptoeing in the library. One of the boys told me that he once saw me still tiptoeing out on the campus after closing the library. Her successors as librarian gradually assumed more responsibilities than she had been allowed to exercise- they did not have to secure the permission of a faculty committee to spend money, buy books, or hire assistants. The operation that Miss DuPre ran with only student help grew considerably in the years after her retirement, but the work we do at the library today is possible because of the foundation she built.